In a month's time, DayZ—the zombie-survival variant of Arma II— has quickly established itself as one of the most appealing mods of a PC game in recent history, if ever. That also makes it an appealing target to malefactors. One such person managed to get aboard the DayZ server admin team and, apparently, turn its servers into a massive botnet or give someone else the permission to do the same. As such, any server to DayZ to which the game's admins have been given remote access may be compromised. The admins sent out an email notice yesterday have posted in the game's official forum about the breach, essentially confirming it. They're asking all server hosts who gave DayZ admins RDP access to scan for any suspicious processes. The person believed responsible has been identified and banned, and legal action is being pursued against him. 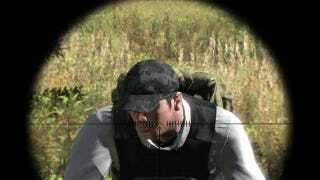 Naturally, that forum thread has devolved to revenge threats, requiring the DayZ admins to demand that no one post his personal information in the thread. One tipster sounded pretty fed up with the state of affairs, but unsurprised that things reached this point. "We've told them again and again they need to be careful who they put on the staff, they need to take things carefully, and again and again they make a mess of things," he told Kotaku. "The language from the devteam is the same thing. We've 'donated' our servers. We should 'trust them' with root access," he continued, the disgust evident in his tone. "Meanwhile, the server hosts are paying $75 per month, bare minimum, to support the player base for this mod. And they want to commercialize it! We pay money so that they can make money, and in the meantime we get turned into a giant, powerful botnet that won't ever see a dime of the mod's commercial viability because they won't do a thing we suggest." The forum thread is at the link below. 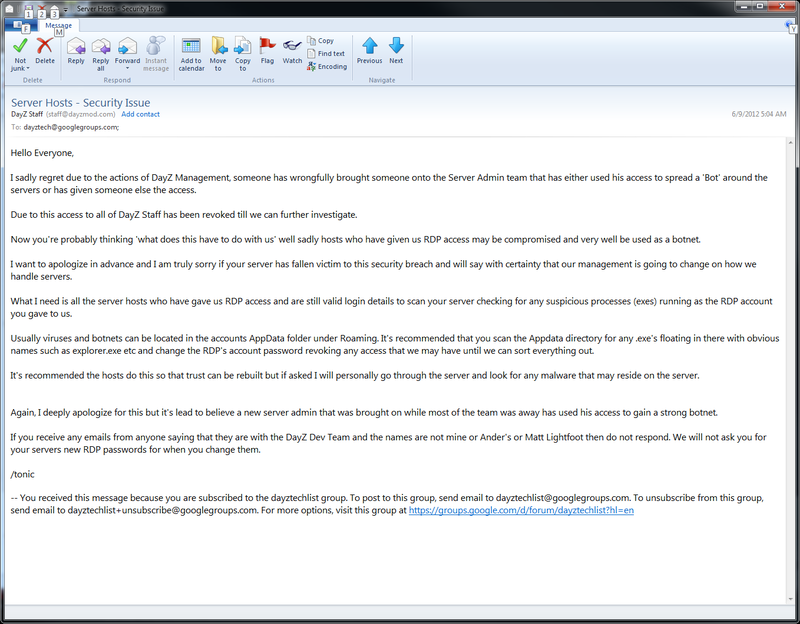 A screenshot of the email declaring the breach can be viewed here. "Perhaps there's some delicious irony in the fact that computers that have been compromised are called zombies," said our tipster. Perhaps.